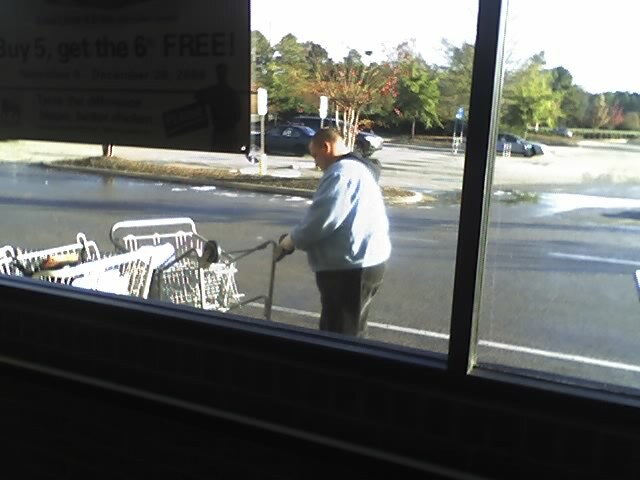 So I stopped by the Food Dog this AM to grab some longnecks since Harris Teeter was out of PBR yet again and I spotted this dude part of a two man shopping cart pit crew. No word if they got the job by shoving all the buggies into a ravine. Teh intrawebz is not being forthcoming with media with which to illustrate the Windrock report so I may have to dive into my own archives for material from past trips before I can finish the post. In other words, don’t hold your breath. ~ by milkman on November 19, 2008.